Reduction techniques can vary in terms of required force, time, equipment, and staff. No single reduction method is successful in every instance; therefore, the clinician should be familiar with several reduction techniques. Posterior shoulder dislocations are typically reduced by means of traction-countertraction. Before any attempts at reduction, it is essential to explain the procedure, benefits, risks, and complications to the patient or the patient’s representative and to obtain informed consent. Most neurovascular injuries are caused by the dislocation itself, but they can be induced or exacerbated by attempted reduction. A conscientious neurovascular examination, both before and after reduction, is important for documenting the presence and alteration of these injuries. For complex dislocations and failed initial attempts, orthopedic consultation in the emergency department (ED) is recommended. The patient is placed in the prone position on an elevated stretcher. 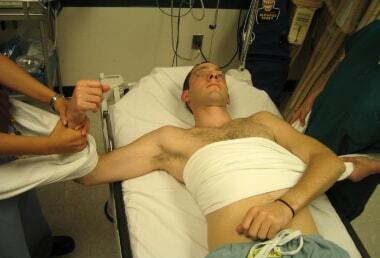 The affected shoulder should be off the edge of the stretcher, hanging downward in 90° of forward flexion. 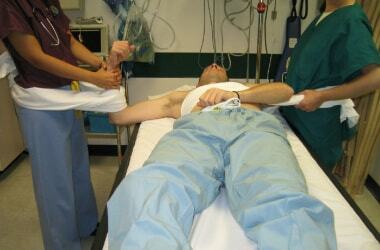 The stretcher should be high enough to allow the patient’s arm to dangle without touching the floor. To prevent the patient from sliding off the stretcher, he or she is tightly strapped down with a sheet, and 5-10 lb of weight is securely fastened to the wrist of the affected arm to provide continuous traction. If weights are unavailable, two to four 1-L containers of normal saline and a stockinette can be used (see the image below). The patient is instructed to maintain this position for at least 15-20 minutes or until reduction is accomplished. 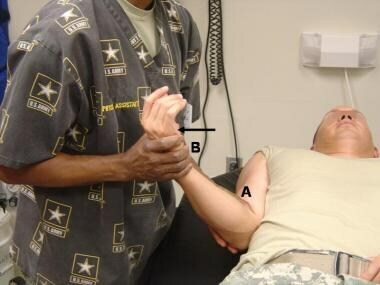 Reduction of shoulder dislocation: Stimson maneuver. With the patient prone or seated and the back exposed, the affected arm is placed in 90° of forward flexion at the shoulder, and slight traction is applied. 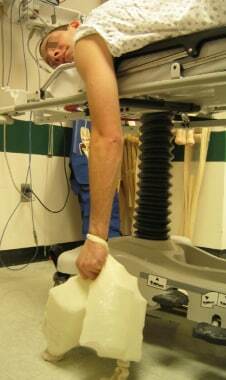 If the patient is prone, weights are used (as in the Stimson technique; see above), or manual downward traction is applied by an assistant. If the patient is seated, an assistant should stand, facing the patient, and use one arm to firmly grasp the wrist of the dislocated arm. 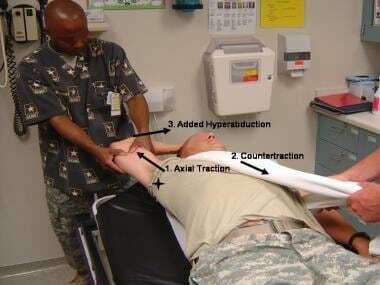 The assistant should then apply steady forward traction parallel to the floor while applying countertraction with the other arm, which is outstretched and resting on the patient’s clavicle (see the image below). Reduction of shoulder dislocation: scapular manipulation. Sitting position. The treating physician then stands lateral to the affected shoulder and stabilizes the scapula by placing the palm of one hand on the lateral aspect of the shoulder with the thumb securely on the superior lateral border, then placing the other palm over the inferior tip of the scapula and positioning the thumb on the inferior lateral border of the scapula (see the image below). Reduction of shoulder dislocation: scapular manipulation. Hand placement. The physician then uses both hands to rotate the inferior tip of the scapula medially and the superior aspect laterally with slight dorsal displacement. The goal is to move the glenoid fossa back into the correct anatomic position. [7, 39] To facilitate reduction, the assistant may apply, along with traction, slight external rotation of the humerus, elbow flexion in 90°, or both. The patient is placed supine on a stretcher. The treating physician adducts the affected arm tightly to the patient’s side with one hand, then, with the other hand, grasps the patient’s wrist, bends the elbow to 90° of flexion, and gently rotates the upper arm externally, using the forearm as a lever, without force or traction (see the video below). Reduction of shoulder dislocation: external rotation. The patient may be supine or prone, with the shoulder close to the edge of the stretcher. The affected arm is placed in full abduction overhead, or the patient is instructed to raise the arm laterally and behind the head. The operator may assist abduction gently. Reduction of shoulder dislocation: Milch technique. This technique has no significant disadvantages. Reduction of shoulder dislocation: Spaso technique. An alternative to the standard Spaso technique is the Waldron variation. In this approach, while the elbow is maintained in a flexed position, the physician firmly hold the epicondyles and applies vertical traction on the humerus while moving the forearm through an arc extending from 10° of external rotation to 10° of internal rotation. The patient is supine on a securely locked stretcher, with the bed elevated to the height of the operator’s ischial tuberosities; this positioning is critical for ensuring smooth application of force. One sheet or strap is placed over the patient’s upper chest, under the axilla of the affected shoulder and underneath the back, so that the two ends of the sheet are of equal length and open to the unaffected side. While maintaining the affected arm in 90° of flexion at the elbow, with both hands around the forearm, the physician applies traction by leaning backward with fully extended arms. It is important to use body weight, not upper arm muscles (eg, biceps), to provide traction along the axis of dislocation while the assistant applies countertraction. Reduction of shoulder dislocation: traction and countertraction. The patient is placed supine on a sturdy immobile surface (eg, a wheel-locked gurney). The physician, standing on the affected side at the patient’s head,  applies axial traction in line with the abducted arm. To facilitate the procedure, an assistant can apply parallel countertraction by using a sheet wrapped diagonally over the affected shoulder. During the application of axial traction, increasing the degree of abduction (if possible) and applying cephalad pressure to the displaced humeral head can aid in reduction (see the image below). Reduction of shoulder dislocation: axial traction and countertraction. Axial traction is applied to arm, and parallel countertraction is applied with sheet wrapped over shoulder. Increasing degree of abduction (if possible) and applying cephalad pressure to displaced humeral head (star) can aid in reduction. After successful reduction of the humeral head, the arm should be fully adducted against the chest wall and supinated and immobilized in that position (see the image below). Reduction of shoulder dislocation: axial traction and countertraction. After inferior dislocation is reduced, arm is adducted, supinated, and immobilized for postreduction radiography. In 2006, Nho et al described a two-step method for the reduction of inferior shoulder dislocation (ie, luxatio erecta humeri). In this technique, the inferior dislocation is converted to an anterior dislocation (step 1), which is subsequently reduced (step 2). The patient is placed supine on a sturdy immobile surface (eg, a wheel-locked gurney). The clinician, standing on the affected side near the patient’s head, places one hand (the hand nearer the patient) on the lateral aspect of the midhumerus and places the other hand on the medial condyle. Step 1 of the reduction may be divided into two parts. In part 1, the clinician pushes anteriorly with the hand on the midhumerus and pulls posteriorly with the hand on the medial condyle (see the first image below). This motion brings the humeral head to a position anterior to the glenoid (ie, the humeral head is now anteriorly rather than inferiorly dislocated). In part 2, the clinician adducts the arm and moves the hand on the medial condyle to grasp the wrist (see the second image below). Reduction of shoulder dislocation: two-step reduction. Step 1, part 1. Push anteroinferiorly on midhumerus with hand A while pulling posteriorly on medial condyle with hand B. Reduction of shoulder dislocation: two-step reduction. Step 1, part 2. After conversion of inferior dislocation to anterior dislocation, adduct arm and grasp patient's wrist. 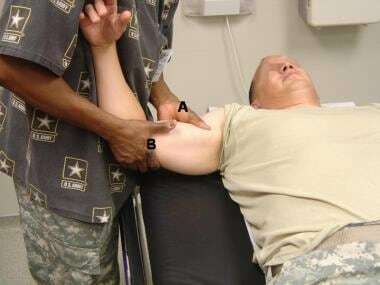 In step 2 of the two-step reduction, the clinician, while holding the arm in adduction against the chest wall, externally rotates the shoulder by pulling on the wrist (see the image below). Reduction of shoulder dislocation: two-step reduction. Step 2. Hand A holds patient's arm in adduction while hand B externally rotates arm to reduce now anteriorly dislocated humeral head. Westin CD, Gill EA, Noyes ME, Hubbard M. Anterior shoulder dislocation. A simple and rapid method for reduction. Am J Sports Med. 1995 May-Jun. 23(3):369-71. [Medline]. Bengtzen RR, Daya MR. Shoulder. Walls RM, Hockberger RS, Gausche-Hill M, et al, eds. Rosen’s Emergency Medicine: Concepts and Clinical Practice. 9th ed. Philadelphia: Elsevier; 2018. Vol 1: 549-68. Davids JR, Talbott RD. Luxatio erecta humeri. A case report. Clin Orthop Relat Res. 1990 Mar. 144-9. [Medline]. Yamamoto T, Yoshiya S, Kurosaka M, Nagira K, Nabeshima Y. Luxatio erecta (inferior dislocation of the shoulder): a report of 5 cases and a review of the literature. Am J Orthop (Belle Mead NJ). 2003 Dec. 32(12):601-3. [Medline]. Garcia R, Ponsky T, Brody F, Long J. Bilateral luxatio erecta complicated by venous thrombosis. J Trauma. 2006 May. 60(5):1132-4. [Medline]. Groh GI, Wirth MA, Rockwood CA Jr. Results of treatment of luxatio erecta (inferior shoulder dislocation). J Shoulder Elbow Surg. 2010 Apr. 19(3):423-6. [Medline]. Naples RM, Ufberg JW. Management of common dislocations. Roberts JR, Custalow CB, Thomsen TW, et al, eds. Roberts and Hedges' Clinical Procedures in Emergency Medicine. 7th ed. Philadelphia: Elsevier; 2019. 980-1026. Allie B, Kilroy DA, Riding G, Summers C. Rupture of axillary artery and neuropraxis as complications of recurrent traumatic shoulder dislocation: case report. Eur J Emerg Med. 2005 Jun. 12(3):121-3. [Medline]. Bradley JP, Tejwani SG. Posterior shoulder instability. Miller MD, Thompson SR, eds. DeLee and Drez’s Orthopaedic Sports Medicine: Principles and Practice. 4th ed. Philadelphia: Elsevier Saunders; 2015. Vol 1: 517-31. Mohseni MM. Images in emergency medicine. Luxatio erecta (inferior shoulder dislocation). Ann Emerg Med. 2008 Sep. 52(3):203, 231. [Medline]. Dodson CC, Cordasco FA. Anterior glenohumeral joint dislocations. Orthop Clin North Am. 2008 Oct. 39(4):507-18, vii. [Medline]. Mallon WJ, Bassett FH 3rd, Goldner RD. Luxatio erecta: the inferior glenohumeral dislocation. J Orthop Trauma. 1990. 4(1):19-24. [Medline]. Brady WJ, Knuth CJ, Pirrallo RG. Bilateral inferior glenohumeral dislocation: luxatio erecta, an unusual presentation of a rare disorder. J Emerg Med. 1995 Jan-Feb. 13(1):37-42. [Medline]. Begaz T, Mycyk MB. Luxatio erecta: inferior humeral dislocation. J Emerg Med. 2006 Oct. 31(3):303-4. [Medline]. Grate I Jr. Luxatio erecta: a rarely seen, but often missed shoulder dislocation. Am J Emerg Med. 2000 May. 18(3):317-21. [Medline]. Freundlich BD. Luxatio erecta. J Trauma. 1983 May. 23(5):434-6. [Medline]. Emond M, Le Sage N, Lavoie A, Rochette L. Clinical factors predicting fractures associated with an anterior shoulder dislocation. Acad Emerg Med. 2004 Aug. 11(8):853-8. [Medline]. Emond M, Le Sage N, Lavoie A, Moore L. Refinement of the Quebec decision rule for radiography in shoulder dislocation. CJEM. 2009 Jan. 11(1):36-43. [Medline]. Halberg MJ, Sweeney TW, Owens WB. Bedside ultrasound for verification of shoulder reduction. Am J Emerg Med. 2009 Jan. 27(1):134.e5-6. [Medline]. Blakeley CJ, Spencer O, Newman-Saunders T, Hashemi K. A novel use of portable ultrasound in the management of shoulder dislocation. Emerg Med J. 2009 Sep. 26(9):662-3. [Medline]. Yuen CK, Mok KL, Kan PG, Wong YT. Bedside ultrasound for verification of shoulder reduction with the lateral and anterior approaches. Am J Emerg Med. 2009 May. 27(4):503-4; author reply 504. [Medline]. Abbasi S, Molaie H, Hafezimoghadam P, Zare MA, Abbasi M, Rezai M, et al. Diagnostic accuracy of ultrasonographic examination in the management of shoulder dislocation in the emergency department. Ann Emerg Med. 2013 Aug. 62 (2):170-5. [Medline]. Stone MB, Sutijono D. Intraarticular injection and closed glenohumeral reduction with emergency ultrasound. Acad Emerg Med. 2009 Dec. 16(12):1384-5. [Medline]. Daya M. Radiographic clue to luxatio erecta. Am J Emerg Med. 1991 Nov. 9(6):624. [Medline]. Miller SL, Cleeman E, Auerbach J, Flatow EL. Comparison of intra-articular lidocaine and intravenous sedation for reduction of shoulder dislocations: a randomized, prospective study. J Bone Joint Surg Am. 2002 Dec. 84-A(12):2135-9. [Medline]. Orlinsky M, Shon S, Chiang C, Chan L, Carter P. Comparative study of intra-articular lidocaine and intravenous meperidine/diazepam for shoulder dislocations. J Emerg Med. 2002 Apr. 22(3):241-5. [Medline]. Fitch RW, Kuhn JE. Intraarticular lidocaine versus intravenous procedural sedation with narcotics and benzodiazepines for reduction of the dislocated shoulder: a systematic review. Acad Emerg Med. 2008 Aug. 15(8):703-8. [Medline]. Wakai A, O'Sullivan R, McCabe A. Intra-articular lignocaine versus intravenous analgesia with or without sedation for manual reduction of acute anterior shoulder dislocation in adults. Cochrane Database Syst Rev. 2011. (4):CD004919. [Medline]. Ng VK, Hames H, Millard WM. Use of intra-articular lidocaine as analgesia in anterior shoulder dislocation: a review and meta-analysis of the literature. Can J Rural Med. 2009 Fall. 14(4):145-9. [Medline]. Urmey WF. Using the nerve stimulator for peripheral or plexus nerve blocks. Minerva Anestesiol. 2006 Jun. 72(6):467-71. [Medline]. Davis JJ, Swenson JD, Greis PE, Burks RT, Tashjian RZ. Interscalene block for postoperative analgesia using only ultrasound guidance: the outcome in 200 patients. J Clin Anesth. 2009 Jun. 21(4):272-7. [Medline]. Blaivas M, Lyon M. Ultrasound-guided interscalene block for shoulder dislocation reduction in the ED. Am J Emerg Med. 2006 May. 24(3):293-6. [Medline]. Blaivas M, Adhikari S, Lander L. A Prospective Comparison of Procedural Sedation and Ultrasound-guided Interscalene Nerve Block for Shoulder Reduction in the Emergency Department. Acad Emerg Med. 2011 Sep. 18(9):922-7. [Medline]. Finestone A, Milgrom C, Radeva-Petrova DR, Rath E, Barchilon V, Beyth S, et al. Bracing in external rotation for traumatic anterior dislocation of the shoulder. J Bone Joint Surg Br. 2009 Jul. 91(7):918-21. [Medline]. Liavaag S, Stiris MG, Lindland ES, Enger M, Svenningsen S, Brox JI. Do Bankart lesions heal better in shoulders immobilized in external rotation?. Acta Orthop. 2009 Oct. 80(5):579-84. [Medline]. [Full Text]. McNeil NJ. Postreduction management of first-time traumatic anterior shoulder dislocations. Ann Emerg Med. 2009 Jun. 53(6):811-3. [Medline]. Itoi E, Hatakeyama Y, Sato T, et al. Immobilization in external rotation after shoulder dislocation reduces the risk of recurrence. A randomized controlled trial. J Bone Joint Surg Am. 2007 Oct. 89(10):2124-31. [Medline]. Brophy RH, Marx RG. The treatment of traumatic anterior instability of the shoulder: nonoperative and surgical treatment. Arthroscopy. 2009 Mar. 25(3):298-304. [Medline]. Ufberg JW, Vilke GM, Chan TC, Harrigan RA. Anterior shoulder dislocations: beyond traction-countertraction. J Emerg Med. 2004 Oct. 27(3):301-6. [Medline]. Kothari RU, Dronen SC. Prospective evaluation of the scapular manipulation technique in reducing anterior shoulder dislocations. Ann Emerg Med. 1992. 21(11):1349-52. [Medline]. Pishbin E, Bolvardi E, Ahmadi K. Scapular manipulation for reduction of anterior shoulder dislocation without analgesia: results of a prospective study. Emerg Med Australas. 2011 Feb. 23(1):54-8. [Medline]. Eachempati KK, Dua A, Malhotra R, Bhan S, Bera JR. The external rotation method for reduction of acute anterior dislocations and fracture-dislocations of the shoulder. J Bone Joint Surg Am. 2004 Nov. 86-A(11):2431-4. [Medline]. Marinelli M, de Palma L. The external rotation method for reduction of acute anterior shoulder dislocations. J Orthop Traumatol. 2009 Mar. 10(1):17-20. [Medline]. [Full Text]. Singh S, Yong CK, Mariapan S. Closed reduction techniques in acute anterior shoulder dislocation: modified Milch technique compared with traction-countertraction technique. J Shoulder Elbow Surg. 2012 Dec. 21(12):1706-11. [Medline]. Ugras AA, Mahirogullari M, Kural C, Erturk AH, Cakmak S. Reduction of anterior shoulder dislocations by Spaso technique: clinical results. J Emerg Med. 2008 May. 34(4):383-7. [Medline]. Yuen MC, Yap PG, Chan YT, Tung WK. An easy method to reduce anterior shoulder dislocation: the Spaso technique. Emerg Med J. 2001 Sep. 18(5):370-2. [Medline]. Fernandez-Valencia JA, Cune J, Casulleres JM, Carreno A, Prat S. The Spaso technique: a prospective study of 34 dislocations. Am J Emerg Med. 2009 May. 27(4):466-9. [Medline]. Perron AD, Brady WJ. Evaluation and management of the high-risk orthopedic emergency. Emerg Med Clin North Am. 2003 Feb. 21(1):159-204. [Medline]. Robinson CM, Aderinto J. Posterior shoulder dislocations and fracture-dislocations. J Bone Joint Surg Am. 2005 Mar. 87(3):639-50. [Medline]. Nho SJ, Dodson CC, Bardzik KF, Brophy RH, Domb BG, MacGillivray JD. The two-step maneuver for closed reduction of inferior glenohumeral dislocation (luxatio erecta to anterior dislocation to reduction). J Orthop Trauma. 2006 May. 20(5):354-7. [Medline]. Ultrasound probe placement for viewing glenohumeral joint via posterior approach. Ultrasound image of normal (right) and anteriorly dislocated shoulder (left). Arrow points to humeral head. Image courtesy of Michael A Secko, MD, RDMS. Classic presentation of inferior shoulder dislocation. Affected arm is hyperabducted, with elbow flexed and forearm resting on top of head. "Regimental badge" area. 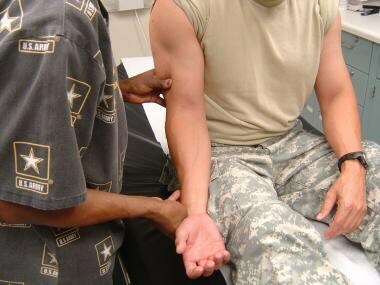 Examine pinprick sensation to this area to assess axillary nerve sensory function. Anteroposterior radiograph of left shoulder shows posterior glenohumeral dislocation. Impaction of humeral head on posterior glenoid results in reverse Hill-Sachs defect (trough sign) on anterior aspect of humeral head. Image courtesy of Dr M A Png, Singapore General Hospital. Axial spin-echo T1-weighted magnetic resonance arthrogram of right shoulder shows tear of posterior glenoid labrum (arrow) and reverse Hill-Sachs defect (arrowhead). Patient had previous posterior dislocation. The authors would like to thank the Bellevue Hospital Housestaff for graciously participating in this project, especially Drs. Adriana Manikian, Karen Franco, Alice Kwan, Heather Larson, and Chris McStay. The authors would like to acknowledge CPT Buddy Leckie, CPT Leon Richardson, Physician Assistants of the 2nd Brigade, 1st Cavalry Division, and Mr. Harold Vick, Nurse Practitioner, for their assistance demonstrating the techniques described in this article and for their brave, selfless service to the United States of America.